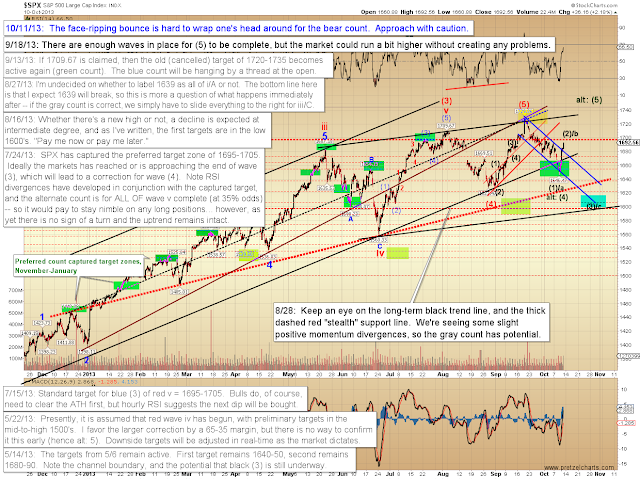 Yesterday saw bears capitulate en masse, while bulls trampled and gored everyone who got in their way, in the hopes that Washington's issues might get resolved soon. 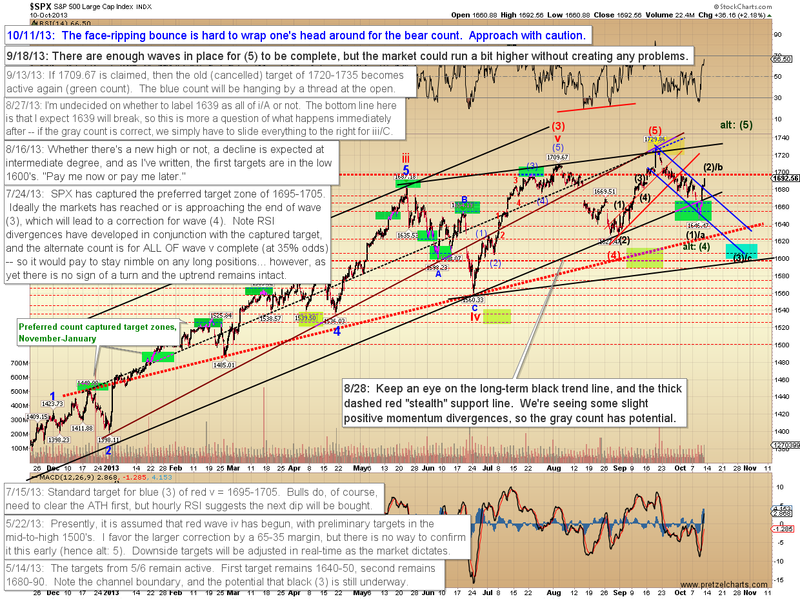 As far as I've heard, nothing actually got resolved -- but perception is reality in the market. 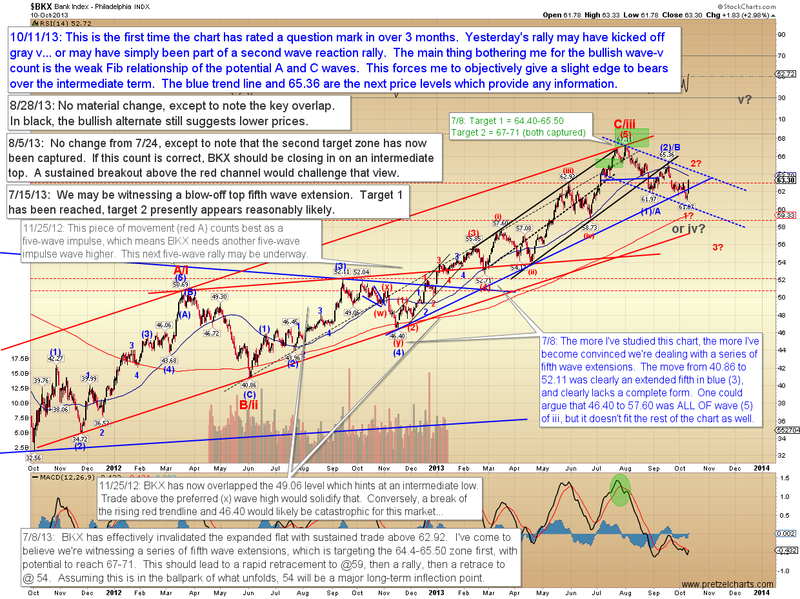 As I talked about yesterday, the market had reached the toughest type of inflection point in Elliott Wave, and from there, it then proceeded to plow right over my preferred near-term count. Most of the traders I've spoken to since the close are now bullish. And why not? After all, the market has had a persistent bid ever since the QE-Infinity liquidity started pouring into the primary dealers' accounts, and every halfway promising-looking decline of 2013 has turned into a new high in fairly short order. The rally appeared to be impulsive, which suggest it isn't over yet, and normally, I'd look for another leg of equal or greater length. However, I'm favoring an unconventional near-term count which I'll outline momentarily. 1. The decline from the all-time high reconciles better as an impulse than a correction, and that leads me to suspect it's not over. 2. The signals I saw at the close on Wednesday led me to expect a snap-back rally, but that rally's strength exceeded my expectations. Yesterday's rally was a face-ripper, and bulls recovered a ton of lost ground in just one day -- normally, that suggests they have "money in the mattress" (or in the printing press, as the case may be) for more. It's probably going to take an event to turn this market back down. In my opinion, the charts are still hinting at the idea that we could get one. But this is as much an instinct call as anything, and trying to predict an event is like trying to predict the winning lotto numbers, so feel free to ignore me and trade what feels right to you. First up is the Philadelphia Bank Index (BKX), which could have completed gray iv -- however, in my opinion, it has the wrong look for a completed correction. I'm presently inclined to think this index makes another new low before it makes a new high. Next up is the S&P 500 (SPX) near-term chart. I'm favoring a somewhat unconventional resolution here -- but again, this is pure instinct, and my instincts can be wrong. 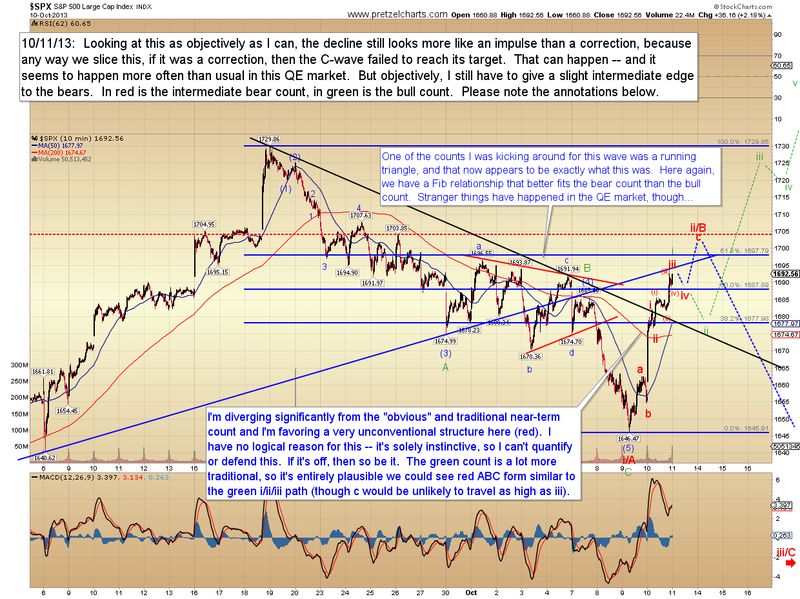 Finally, the SPX hourly chart. In conclusion, I'm fully prepared to shift my intermediate footing depending on how the next couple sessions shake out, but I still feel the charts have bearish potential and, at the moment anyway, still feel that they'd look better with a new low. Trade safe. Oh how i'd love the non-obvious count! 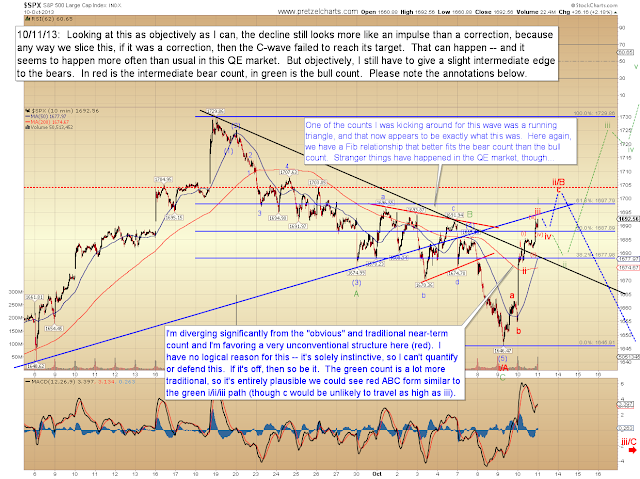 Not sure that I see the same bearish potential in the SP500. The price action looks pretty bullish right now. Unless of course the debt ceiling talks stall, which could send the markets into a tailspin again. The bounce we saw this week reminds me of previous bounces when budget log-jams have cleared. Agree with ev101--this reminds me of "kick off" events that just keep on pushing as implausible as they would seem in the face of the news and situation. One thing I've learned in my trading career: someone ALWAYS knows well before myself and 99.99999% of market participants. And they always leave tracks. Sometimes you can benefit from their tracks, other times you can't (trading gold 4/10th of second before it was even possible to have the FOMC info in Sept comes to mind). Keep up the good work Pretzel. Your thoughts and charts are second to none. Always appreciate your hard work.